With the clocks ‘Springing’ forward this weekend, yes an hour less in bed but longer days, surely has to be a good thing. 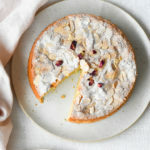 Why not take the time to make this simple almond cake, naturally gluten free for Mother’s Day. While appreciation for a parent should be every day of the year, I still love to make my mum feel extra special with a handmade gift. Potato flour is a great addition to this recipe (you can use cornflour instead) adding a lightness. I’ve teamed it with Tim’s Dairy London collection Rhubarb & Rose yogurt a perfect partner to this sweet treat. I’ve added a little lemon zest to the batter but orange would work equally well. 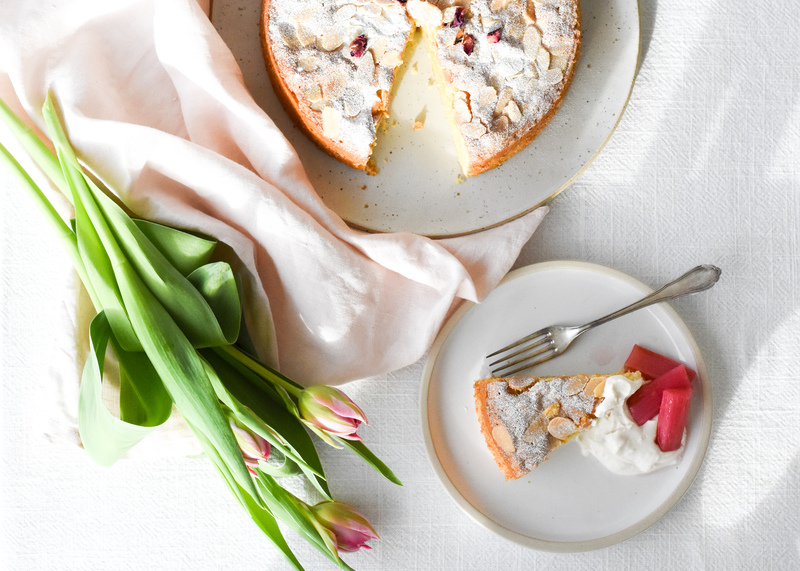 Almond, rose petals and rhubarb are an amazing flavour combination, give it a go, you won’t regret it. Preheat the oven to 160C Fan/180C/Gas 4. Grease and line the base of a 20cm round cake tin. Combine the ground almonds, potato flour, zest of the a lemon and the baking powder. Beat the butter and sugar in a free standing mixer until really light and fluffy. Add the egg yolks one at a time, beating in-between. Tip the almond mixture into the butter and gently mix and fold in. Whisk the egg whites in a clean bowl until very stiff. Now stir one tablespoon of the egg whites into the batter to loosen it. Fold in the remaining and pour into the prepared tin. Sprinkle the flaked almonds on top. Bake for 40-45 minutes or until a skewer inserted into the cake comes out clean. Remove from the tin and sprinkle with icing sugar. Serve with Tims Dairy rhubarb and rose yogurt. * You can replace the potato flour with cornflour.